Kudos to Laura Wright and Kelly Monaco for knocking it out of the park today. Matt tells Liz that he’s taking Siobhan into surgery and her next of kin needs to be contacted. Liz says she’s been unable to get in touch with Lucky. Then, she goes on to explain about Siobhan&apos;s earlier fall down the stairs and that she wasn’t wearing a seat belt. 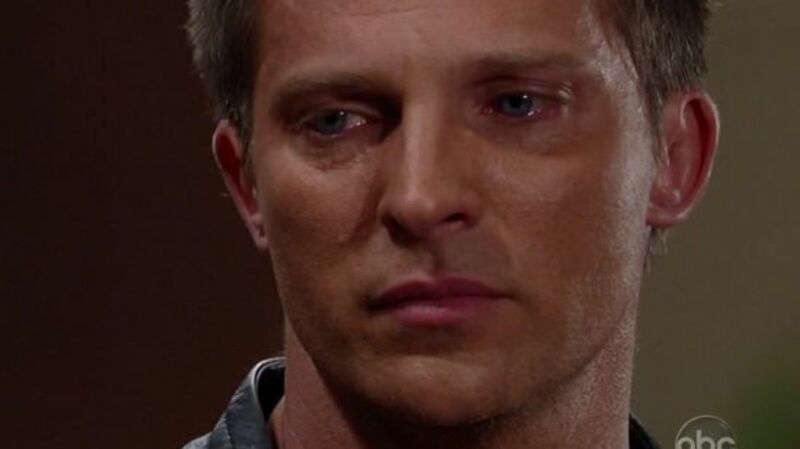 Before Liz can continue, Steve shows up, gets Matt to leave, and proceeds to rake Liz over the coals about what really happened. Liz insists she didn’t push Siobhan, or try to kill her. She wonders why her brother won’t believe her. Steve’s angry that this all about Lucky and warns her to get her facts straight, since it will be Siobhan’s word against Liz’s. When Sam shows up, Monica lets her know that Jason’s having tests done, but is still unconscious. Sam explains that Carly had an emergency, so Jason took off to help her. Monica thinks Sam is very good for Jason, especially since she accepted him for who he is. She knows that losing Jake put things in perspective for them. Sam wonders why Carly couldn’t have dealt with the emergency herself and Monica assures her that Jason will pull through. Carly explains to Olivia what Skye told her. Olivia says she explained to Sonny that Carly had an emergency. Carly is worried that Sonny will find Jax and attempts to leave, but Epiphany stops her. Olivia offers to go to Carly’s and look for Jax. Olivia asks for Dante’s car keys and he offers to drive her anywhere, but she insists, and takes his keys. Sonny gets to Carly’s house and hears Mercedes knocking on the locked basement door. He questions her, but she didn’t see who took Josslyn. Olivia shows up and says that Jax is back in town and coming for Joss. Sonny’s angry that Jax decided to kidnap Carly’s daughter and take what was Carly’s and Sonny’s. Olivia points out that Brenda wasn’t a belonging and Sonny didn’t own her, but Sonny’s not paying attention. He swears that he won’t let Jax get away with this. Olivia tells him that both Carly and Jason have been in a serious accident, but Sonny’s more concerned about finding Jax and dealing with him. Olivia says she’s going with him. Michael and Abby are still yucking it up on the island. He gives her an extravagant dress as a gift and she realizes it’s the same thing Sonny does with all his women. She doesn’t want him to follow in his father’s footsteps. Michael doesn’t understand why she’s so upset, since he just wants to enjoy himself. Abby explains that she doesn’t want to be paraded around like one of Sonny&apos;s women. If she wanted to be treated like eye candy, she would have stayed at the club. Michael fires back by saying that he shouldn’t have taken her off the pole. Abby doesn’t want to fight, but she doesn’t want Michael to rely on his name to get ahead. She needs to earn the Quartermaines trust and keep her job. Michael accuses her of liking him better when he was broken down, and feels she doesn’t want a real man. He wonders what she thought she was getting into when they got together. Michael claims the mob isn’t that different from the corporate world, citing how evil Jax makes his money, and Sonny&apos;s good behavior toward his men. Abby thinks Michael doesn’t have to be like Sonny or rebel against Jax, and would make a good lawyer. Later on, Abby shows up wearing the dress. Shawn continues to have memories and stumbles around in the rain. Jax’s car gets flooded in the rain, so he and Josslyn take off on foot. Shawn finds the abandoned car and continues with his memories, until a dog shows up. Seriously? A freakin’ dog? After Epiphany busts Carly for trying to use the phone, Carly spots Sam and asks about Jason&apos;s condition. Sam informs her that she and Monica have no idea of his prognosis and wonders if Carly is proud of herself. Sam reminds Carly that she and Jason asked her to have boundaries and act like an adult. Carly says her daughter is more important. Sam says they asked her to respect their relationship and points out that Carly hasn’t even seen or heard from Jax. However, she still showed up looking for Jason anyway, because she has no consideration for JaSam’s relationship. Carly thinks Sam is mad because Jason can’t say no to her, but Sam claims it has nothing to do with choosing one over the other. She also believes it was especially heinous that Carly used Jake to get Jason to go with her. Sam wonders why Carly didn’t just go home first. Carly says Jason loves Josslyn and a missing daughter trumps any boundaries. Sam points out how Carly crying to Sonny turned out for Jax, but Carly feels no responsibility for what Sonny does. Sam says Carly uses other people’s pain to get what she wants, and now Jason is hurt again. Carly says she didn’t cause the accident and accuses Sam of not knowing what it’s like to lose a child. Sam smacks the taste out of Carly’s mouth! Carly wonders who’s acting like the adult now, and threatens to smack her back. Sam says Jason could be seriously injured, but Carly feels she knows more about Jason and his many injuries. At this point, Monica informs the ladies that she’s the one with the most losses, and Carly forces out a ‘sorry’. Sam says Carly uses her kids and expects Jason to take care of them. She never once says thank you, but continues to take until there&apos;s nothing left. Carly says she loves Jason and not to underestimate what she and Jason mean to each other. She tells Sam that she’s not going anywhere. Sam says Carly’s love costs a lot, and hopes it doesn’t cost Jason his life. Liz and Dante are waiting for Siobhan&apos;s OR news together, and Liz will blame herself if Siobhan doesn’t make it. Dante tells her not to say that, or people will believe she actually pushed Siobhan down the stairs. Liz explains that if she hadn’t strayed from Lucky, he would never have met Siobhan and they wouldn’t be here now. Liz suddenly realizes where Lucky might be, and heads out alone to find him. Skye takes Edward to her hotel room, as he’s complaining of fatigue and blames the heat. However, Skye figures he’s trying to figure out why she’s in town. Sonny comes charging in, guns blazing, barking at Skye to tell him Jax&apos;s whereabouts. Skye denies any knowledge. Olivia tells Edward that Jason’s been in a bad accident. Patrick comes to update the women that Jason is not doing well, and has a suffered a serious head trauma. He’s unconscious and unresponsive, and they don&apos;t know if or when he will wake up. Monica fears that it’s just like before, but Sam assures her that Jason will come back to them.